As with previous iterations, this year’s edition will bear a strong local flavour. But if you need a little help in working out who’s who in the rota of more than 120 Singaporean writers, Gwen Pew spotlights five local authors you should know about. Best known as the author of the children’s book series The Dairy of Amos Lee, Foo is a near-permanent fixture on the The Straits Times bestsellers list. Her first young adult fiction, Thomas Titans: Men Among Boys, is being made into a telemovie that is slated for release at the end of this year. Catch Foo at ‘Text Into Film’: 1 Nov, 7-8pm; Makeover Tent, Campus Green, SMU. ‘Writing for the Global Audience’: 9 Nov, 4-5pm; Makeover Tent, Campus Green, SMU. ‘Natural Compositions’: 9 Nov, 5.30-6.30pm; Glass Hall, Singapore Art Museum. Catch Yap at ‘Beyond Travel Guides’: 8 Nov, 10-11am; Makeover Tent, Campus Green, SMU. Currently a law undergraduate at the University College of London, Yam has published three poetry collections, Chasing Curtained Suns (2012), Scattered Vertebrae (2013) and Intruder (2014). In 2012, he also became the youngest person to be nominated for the prestigious Pushcart Prize in the US. ‘I try to tread a fine line between honesty and storytelling, revelation and commentary. I also keep an international audience in mind,’ he says. ‘My event at SWF is targeted at young or emerging writers, so I’ll be sharing my creative writing journey, and elucidate the ways in which a Singaporean adolescence will impact a writer’s creative output. For example, all three of my poetry collections interrogate the experiences with which Singaporean youths are familiar: the dichotomy between private and public selves, university, National Service and globalisation, among others.’ Catch Yam at ‘Finding My Voice’: 8 Nov, 7-8pm; Seminar Rooms, National Museum of Singapore. One of the hottest up-and-coming names in the local theatre scene, Tan is an associate artist with Checkpoint Theatre, and has worked with a range of companies, including Yellow Chair and Wild Rice, for whom he penned the pantomime, Jack and the Bean-Sprout, last year. Catch Tan at ‘Plays Station’: 8 Nov, 4-5pm; Centre 42 Black Box. ‘Apart’: 9 Nov, 7-8pm; Gallery Theatre, National Museum of Singapore. A recipient of the Cultural Medallion for Literature in 2003, Yeng is a poet, novelist, playwright and critic with 25 book titles under his belt. Three of them – 骚动 (Unrest), 我与我自己的二三 事 (Trivialities about Me and Myself) and 画室 (Art Studio) – earned him the Singapore Literature Prize. At this year’s SWF, he’ll participate in three events: the launch of the English translation of his novel 我与 我自己的二三事; a dialogue with his translator; and he’ll act as moderator in a panel discussion among three young Chinese writers. ‘I look forward to sharing my experiences and encourage them to continue writing in Chinese,’ Yeng says. Catch Yeng at ‘座谈会: 就是爱用 华文写作!’: 1 Nov, 5.30-6.30pm; Seminar Rooms, National Museum of Singapore. ‘Trivialities About Me and Myself’: 2 Nov, 10-11am; Festival Pavilion, Campus Green, SMU. ‘在翻译世界里交汇’: 2 Nov, 11.30am- 12.30pm; The Salon, National Museum of Singapore. The i Light festival is back again to invade Marina Bay with a host of environmentally-friendly art and activities. Gwen Pew rounds up the best events this year. 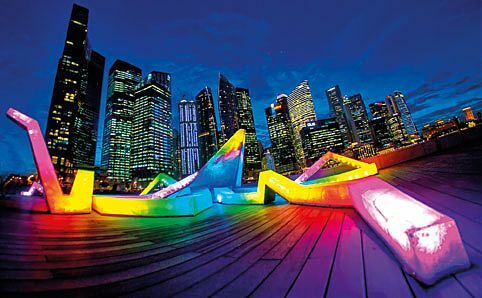 21 Feb 2014: This month, the waterfront of Marina Bay will again be transformed into a beautiful landscape of lights as the bi-annual i Light festival returns for three weeks. Organised by the Urban Redevelopment Authorities, the festival urges companies in the area to switch off unnecessary lights and turn up their air-conditioning temperatures to promote environmental sustainability. Several artists have also been invited to create energy efficient light art. This year, they’re back not only with plenty of Instagram-worthy installations, but a range of other activities to keep the whole family entertained as well. Here’s what you should keep your eye – and camera – out for. Works by more than 25 artists, hailing from both our own sunny shores and overseas, will be dotted around Marina Bay. Memorable highlights from the last edition include the Merlion sculpture’s colourful new look, created by Portuguese collective OCUBO, and local artist Ryf Zaini’s sprawling installation, ‘5QU1D’ (pictured above). This time, we can expect more stunning and quirky pieces, such as Greek artists Maro Avrabou and Dimitri Xenakis’ ‘The Guardian Angels’, which comprises a series of “watering-lanterns” (flower pots that are colourfully lit from the inside), and ‘The Beat’ – glowing, pulsing light globes made by Cherry Wang from local design firm Arup. Should you get hungry from wandering around the art, there are three places you can go to grab a bite. If you’re after something a bit more casual, check out the two food trucks, Kerbside Gourmet and The Travelling C.O.W. – the former is a charity initiative that promises to donate one dish to needy families for every dish bought, while the latter boasts the title of being Singapore’s first mobile food truck. For something more upscale, PasarBella will be leaving their Grandstand home and setting up a station offering a range of fresh produce. From fire dancing (9, 15 & 29 Mar) to renditions of popular English and Mandarin hits sung by the Hark Performing Team (8 & 22 Mar), there are plenty of live acts to catch this year. The Singapore Sky Dancers will be also putting on a light show of synchronised kite flying at Go Fly Kite (15, 16, 29 & 30 Mar), or you can even try your hand at playing with illuminated props – such as hoops and staffs – with the performers of the Illuminated Street Shows (16 & 28 Mar). Keep a look out for the roving Neon Stilt Walkers (7, 8, 22 & 23 Mar), too! Local flea market group, For Flea Sake, will be setting up a Goodnight Market to sell everything from paintings to pastries, while the people behind the weekly Sentosa Broadwalk Bazaars, TGIF Bazaars, will be organising thei Light Marina Bay Waterfront Bazaar, whose range of products include lighted gadgets, collectible items and environmentally-friendly goods. If you’re looking to get fit from more than just walking, there are a number of ways to exercise while enjoying the festival. We’re especially taken with the idea of Glo Yoga (22 & 23 Mar), where instructors from Spice Yoga will take you through a series of stretches against the skyline. Otherwise, instead of just admiring the skills of professional skaters at the Singapore Rollersports Federation’s Skate Competition & Demonstration (15 & 16 Mar), learn to do it yourself from the experts at the Fun Skate Clinics (10-28 Mar); if you already know how to, then join in their Fun Skate & Walk (15 Mar) from the Float to Gardens by the Bay. Fathers and sons (yes, this one is only for the dudes in the family) can also bond at the Adventure with Dad camp (22 & 23 Mar). There will be free guided tours around the area available during weekend evenings, where volunteers will take visitors around to see various art pieces. There are two routes to choose from – just register at least one day before on their website. For those wanting to get a more unique perspective of the installations and skyline, book a 30-minute boat tour with the Singapore River Explorers. Meanwhile, corporate teams who might have a few thousand bucks to spare can take on the SCS Marina Bay Challenge (8 Mar; it costs $5,000/ team of six, but all proceeds go to the Student Care Services charity) to complete a series of tasks at various checkpoints – the winning team will get to bring home a trophy! Back for the 16th edition, Singapore’s largest literary festival returns this month with a host of talks, workshops and events to inspire the country’s love for the written – and spoken – word. Gwen Pew speaks to the Singapore Writers Festival’s programme director, Paul Tan. Workshops, author’s talks, meet and greet sessions – this is a bookworm’s dream come true. Image courtesy of the Singapore Writers Festival. 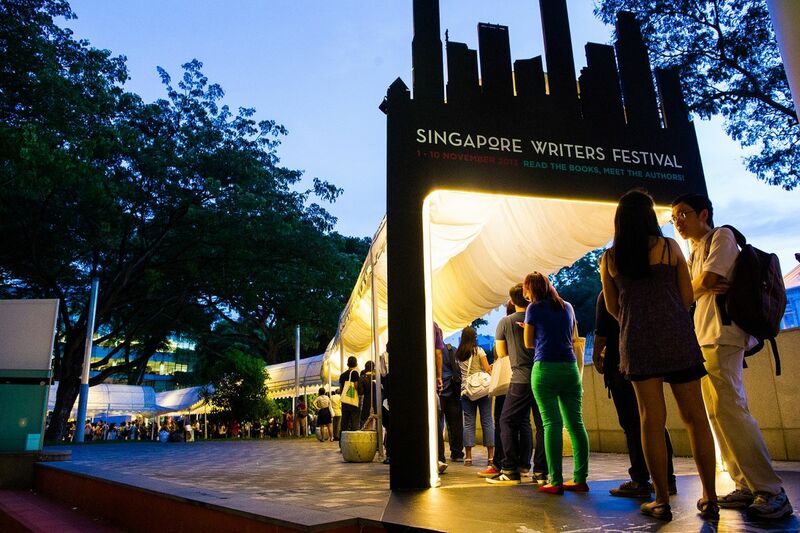 25 Oct 2013: Back for the 16th edition, Singapore’s largest literary festival returns this month with a host of talks, workshops and events to inspire the country’s love for the written – and spoken – word. ‘The Singapore Writers Festival has always sought to connect our audiences with literature in diverse ways, and through topics close to their hearts,’ says festival director Paul Tan. Amongst the exciting line-up of over 190 authors this year are appearances by the UK’s first female Poet Laureate Carol Ann Duffy, journalist, children’s author and daughter of physicist Stephen Hawking, Lucy Hawking, and best-selling crime fiction writer Peter James. France-based Chinese Nobel Laureate Gao Xingjian will also be premiering his documentary Requiem for Beauty, while philosopher AC Grayling will present a lecture on our interactions with the world. Of course, it’s not just about bringing in the big shots from overseas – plenty of local talents will be showcased too. ‘Some of the highlights include a revisit of classics like Animal Farm and Brave New World through the lens of Singaporean writers Gwee Li Sui and Adrian Tan and “guerrilla” literary performances around the Singapore Biennale installations,’ says Tan. As part of the Esplanade’s annual Da:ns Festival, Irish dance company Fabulous Beast will be bringing their critically-acclaimed production of Rian – a show that fuses Celtic and West African music and dance styles – to our sunny shores. Gwen Pew speak to Michael Keegan-Dolan, director and choreographer of the show. 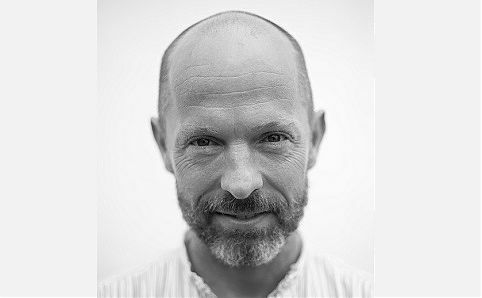 Irish director and choreographer, Michael Keegan-Dolan. Image courtesy of Esplanade Theatres. I knew I wanted to be a dancer from the age of four when my mother brought me to see a Christmas Pantomime at the Gaiety Theatre in 1973 (the same theatre where Rian premiered in 2011). However, I did not get to take my first dance class until I was 17. I trained for three years in London at the Central School of Ballet from the age of 18 to 21. I formed Fabulous Beast when I was 27 in 1997. Rian is a celebration of the magic that happens when music and dance meet.Rian is about collaboration and community. It is about recognising our ancestors and the imprint they have bestowed on each of us. It is about the pure pleasure and joy anyone can experience when singing, playing or dancing. It is about sharing this pleasure and this sense of community. What are some of the characteristics of Irish and West African dance? West Africa, or more specifically, Mali, is one of the musical centres of the world. Ireland also has a great tradition of music. Good dancing is about good listening and allowing that listening to shape the body’s movements. You need good lungs, strong legs, a mobile waist and expressive hands. Good dancing, be it Irish or West African, is about the harmonious movement of the limbs in rhythm through relaxed but concentrated listening to quality music. How did you introduce the non-Irish dancers to Irish music? Liam [Ó Maonlaí, musical director of Rian] started playing on day one and the dancers started dancing. Over the weeks of work they got to know each other better as their dancing got to know his music. After a few weeks, [musicians] Cormac, Eithe, Maitiu and Martin arrived. The sound of the band began to take shape. I encouraged the dancers to keep dancing, keeping listening to the music and to follow internal impulses. They did not need much encouragement. The most difficult thing on some days was to get the music to stop and get the dancers to rest and eat. Occasionally the dancing could go on for 12 hours or more. What’s next for you and Fabulous Beast? Further exploration of West African Music, a new production of Swan Lake, and we are also looking at staging a series of W.B Yeat’s plays entitled, Four Plays for Dancers. As Queenstown district turns 60 this September, Gwen Pew recounts the area’s vibrant history and checks out what you can learn from the My Queenstown Festival. 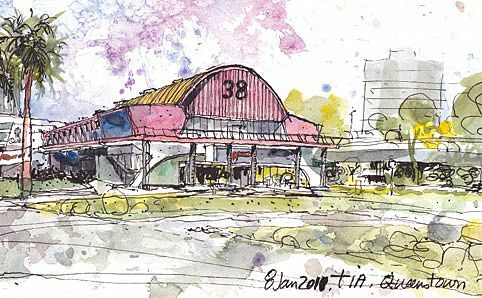 A sketch of the former Margaret Drive Hawker Centre by Urban Sketchers’ Tia Boon Sim. Image courtesy of the artist and Epigram Books. 10 Sep 2013: Once an idyllic village called Boh Beh Kang – meaning ‘the endless river’ because locals couldn’t determine its source – the area that became modern day Queenstown lay in a swampy valley between two hills and used to be home to about 350 Hokkien- and Teochew-speaking immigrant families. The villagers were forced to move out in the 1960s, however, as the British government made plans for the district to be developed into a self-sustaining town to help alleviate the number of people living in cramped conditions around Chinatown (as part of the Singapore Improvement Trust during that era). The name Queenstown was chosen in 1953 in honour of Queen Elizabeth II’s coronation, and the Princess Margaret Estate (also known as Strathmore and Dawson) was completed in 1956. Schools, police stations, hospitals, sports complexes and other social facilities were soon built, and the town went down in history as the first satellite estate in Singapore. While its heyday has passed and many of its iconic buildings and structures have now been demolished – the derelict Queenstown Cinema and Bowling Alley was torn down this June – residents with fond memories of the district will nonetheless be commemorating its diamond jubilee this month. A number of performances, parades and other activities will be taking place over two weeks, but first, here are four other things that you’ll be learning about at My Queenstown Festival. On the afternoon of 25 May 1961, what has been deemed Singapore’s deadliest fire broke out in the Bukit Ho Swee settlement. It claimed four lives, injured more than 80 people and destroyed some 16,000 homes. In this exhibition, visitors will be able to read more about the details of the fire, as well as the relief and relocation efforts that took place afterwards. Photographs, fire fighting tools, a recreation of a burnt housing structure and other artefacts will also be shown. Queenstown Community Centre Concourse 365 Commonwealth Ave. Marriage ceremonies have always been an elaborate affair for everyone involved. In this exhibition, visitors can learn more about the traditional customs practised by the various communities in Singapore’s multi- cultural society and find out the differences and similarities between Malay, Chinese, Indian and Eurasian weddings. Dawson Place Shopping Centre 57 Dawson Rd. Ever wonder how Redhill got its name? Hint: it has to do with the blood of a clever young boy who helped keep out aggressive swordfish from the area (and no, it wasn’t the fish that killed him). Find out the full story and more about legends surrounding other areas of the town in this exhibition. Other characters include the two sisters whom Sisters’ Island is named after and a slave who rose to become the commander of the King’s army – there’s plenty here to let your imagination take flight as you pass these places on your daily MRT ride. Mei Chin Market and Food Centre Blk 159, Mei Chin Rd. Local art group Urban Sketchers – most well-known for their beautiful ‘We Love…’ book series – capture their memories of Queenstown with pen and paper. Their masterpieces, which depict places such as Queenstown Library and the former Margaret Drive Hawker Centre, will be on display to bring these demolished buildings back to life, along with additional historic images. Their newest title, ‘We Love Queenstown’, came out at the end of last month. The Mid-Autumn Festival falls on the 19th of September this year. From Chinatown to Gardens by the Bay, Gwen Pew and Chen Ting round up the best places to soak in the lunar celebrations. Get your fill of the traditional Mid-Autumn pastry – and some contemporary spin-offs – from renowned bakeries and hotels such as Baker’s Oven, Shangri-La and InterContinental Singapore at discounted rates at City Square Mall’s Delightful Mooncake Fair. To sweeten the occasion even more, chef Pang Nyuk Yoon will be giving a demonstration on the art of mooncake-making (weekends from 7-15 Sep, 7pm), while the Singapore Wind Symphony will be performing a concert titled City Swing, playing sweet swing, jazz and Bossa Nova tunes all afternoon long (25 Aug, 4pm). 180 Kitchener Rd (www.citysquaremall.com.sg, 6595 6595). MRT: Farrer Park. Various times. Free. Admire the moon by the stillness of the lake at Chinese Garden, where lanterns will be displayed and Shaolin kungfu masters will be performing incredible feats of power. In addition to the usual festivities, some prehistoric visitors will also be making an appearance this year – life-size animatronic dinosaurs will be roaming and fighting within the gardens – and lucky kids might even get to go home with free gifts while stocks last. 1 Chinese Garden Rd (www.lanterncarnival.com, 9003 6612). MRT: Chinese Garden. Sun-Thur 10.30am-11.30pm; Fri & Sat 10.30-12.30am. Adult $12; child $6. The home base for all Mid-Autumn festivities, Chinatown will leave you dazzled and entertained until well after the full moon has set. The opening night will see the official street light-up ceremony, followed by a line-up of multicultural song and dance performances and, of course, a beautiful fireworks display that can be witnessed along New Bridge Road and Eu Tong Sen Street (7-10pm). Be sure to also soak in the colourful enclave’s festive air by visiting street bazaars and nightly cultural shows, join in the first ever Chinatown Mid-Autumn Walking Trail (8 & 14 Sep, 7-8.30pm; each trail is conducted in English and limited to 15 participants, so book early by emailing hr_zhang1984@yahoo.com.sg) or participate in the annual Mass Lantern Walk (15 Sep, 7-10pm). 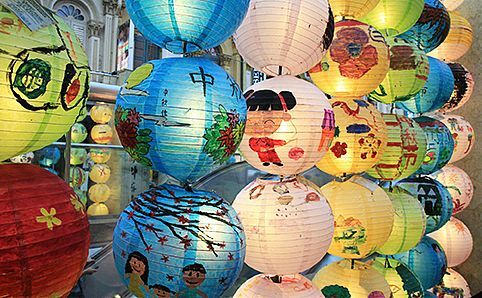 There are also lantern making (31 Aug, 8-10pm) and lantern painting (1 Sep, 9am-noon) competitions at Chinatown Point to get you in the mood prior to the festival. Various locations across Chinatown (www.chinatownfestivals.sg, 6323 2758). MRT: Chinatown. Various timings. Free. Gardens by the Bay will be celebrating the traditional Chinese festival for the first time this year, with the Flower Field inside the Flower Dome set to be transformed into a carpet of autumnal floral splendor from 9 Sep onwards. A bevy of activities have also been planned for all the family to enjoy, from elaborate light displays to lantern-making workshops, and photography competitions to mindboggling Chinese riddles. Alternatively, sit back as local and overseas groups put on a range of dance, theatrical, opera and musical performances, which you can catch whilst being surrounded by a healthy dose of nature. 18 Marina Gardens Dr (www.gardensbythebay.com.sg, 6420 6848). MRT: Bayfront. Various times. Various prices. Laugh yourself silly with these highlights from the Melbourne International Comedy Festival. This year’s roadshow – coming to Singapore for the ninth time – features award-winning comics Frank Woodley, Nazeem Hussain, Tommy Dean, Kate McLennan and host Daniel Townes. Gwen Pew picks their brains. 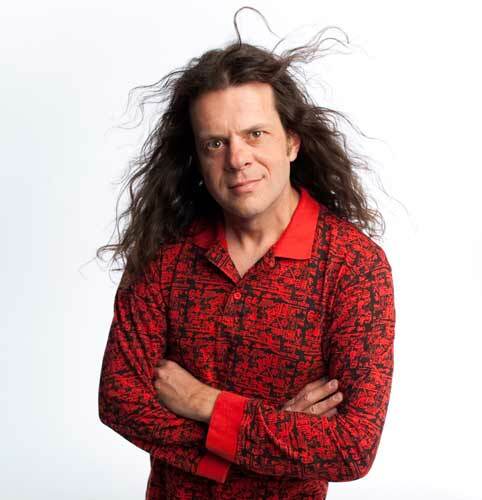 The hilarious Australia-based American comedian, Tommy Dean. Knock knock, who’s there? Door bell repair man. What’s the best (by that we mean worst) heckle you’ve ever gotten? What’s your most embarrassing moment onstage? My most embarrassing moment on stage was when I was performing stand-up in a theatre venue where the stage was all carpeted and I felt myself standing in a spot where there was a trap door. I continued my stand-up and began to dance and, the next thing I knew, I fell four feet below the stage. It got worse when I needed people to come and help me get out. Sum up your impression or expectations of Singapore in three words. Kid’s jokes are my favourite because they often make no sense at all – like the time my four-year-old godson rang me up and said, ‘Aunty Kate I have a joke. Today I went to Kinder and I did a wee up my back and in my shoes.’ So proud. How do bees comb their hair? With a honeycomb. I got booed on to the stage in England during The Ashes one year. It wasn’t so much a heckle as I hadn’t even started yet but it’s the one that stands out the most. One time i accidentally left the zipper open on my jeans and didn’t know until someone pointed it out after about 10 minutes. My current favorite: My dog is a cross between a pitbull and a collie. He mauls people and then runs to get help. I got an audience participant on stage and she backed away from the audience nervously and fell backwards off the stage. The audience gasped and I rushed over. She was fine and laughing but she was so embarrassed that she crawled out the back way and wasn’t seen again. I tried to explain to the audience, but all they saw was someone fall backwards off the stage and never reappear. Things were awkward from then on. One of the hippest events on the indie literary arts calendar is back. Gwen Pew speaks to Marc Nair, local spoken word poet and one of the main guys driving the whole event. A performance from Lit Up Festival. Image courtesy of Word Forward. How did Lit Up begin? Lit Up was started in 2009 by Word Forward. Chris Mooney-Singh and Savinder Kaur, the directors, envisioned an emerging writers and performers festival. This was the form of Lit Up from 2009 to 2010. Starting in 2011 and carrying on to 2013, Lit Up began to take on a more multi-disciplinary form, and incorporated visual art into its line-up. The focus also shifted from overseas artists to local artists, as we began to see the need for a platform to support and provide opportunities to young and capable artists. What will be different about Lit Up this year? This year, Lit Up pushes the envelope of collaboration in both the visual and performing arts. This year’s Visual Arts program includes a cross-disciplinary segment, Tête-à-tête. It brings together three pairs of artists who primarily work in different mediums. This dialogue – between poet and painter, photographer and sound artist, graphic designer and installation artist – will be presented at the exhibition. For the performing arts, we have Echo, a multi-disciplinary devised performance incorporating poetry, music and movement as well as a regional collaboration for one of the key performances, ‘She Walks Like A Free Country.’ This spoken word show brings together seven female poets from Singapore and Malaysia. Tell us more about the theme of ‘Progression’ – why was it chosen and how will it be portrayed? I chose ‘Progression’ as the theme for Lit Up 2013 because it felt like a word that was timely in the context of Singapore’s push to raise its population to 6.9m by 2030 as well as the slew of fractures, whether socially or infrastructurally, that has risen of late. Economic progression seems viable but is not without its fault lines. So I was interested to see how ‘Progression’ is applied in art, and how artists would interpret both positive and subverted notions of ‘Progression’ in Lit Up. How do you decide the line-up and events of the festival? A majority of the performances and visual artists were approached for this year’s festival. We felt that a curated approach is still necessary as we don’t have the resources to put out an open call. We also had some artists approach us to request to be featured in Lit Up. We accepted based on the quality of their work and relevance to the theme for this year. Most if not all of the invited artists are creating work specially for the festival, and we are very excited to present such a huge body of work. How is the festival structured? The festival operates holistically across a number of spaces. The majority of the performances are at Aliwal Arts Centre, although we do have talks and video installations at Orita Sinclair School of Design. Visitors to Lit Up will be able to attend back-to-back performances as well as take the time to walk through the visual arts gallery, featuring 13 installations. Are there any highlights at the festival that should not be missed? Everything at Lit Up is important! But it really depends on your taste. If you want interactive activities, workshops take place on both Saturday and Sunday mornings. We also have a great line-up of bands playing on Sunday evening as part of The Sarong Party, the closing event for Lit Up 2013. Our headline acts are Mosaic, a play by Joel Tan, and She Walks Like A Free Country. However, there are numerous smaller plays and performances that you should check out as well. Focussing on the spoken word scene in Singapore – has it changed a lot over the past few years? The spoken word scene has burgeoned over the past few years. For many years, there was only Poetry Slam to hold up the flag of spoken word, together with the occasional performance by visiting poets. But in the last couple of years, a number of both curated and open-mic events have sprung up, like Destination Ink, Singapore Arts Salon and Speak, and all these help to encourage and grow the scene by providing more avenues for writers to share their work. Do you think Lit Up has contributed to that change? Lit Up has always had the word at the core of its existence. Whether written or performed, we aim to centre every performance and exhibition around this ethos. Many of the artists involved in running and performing in various open-mic events are also part of Lit Up, and we hope to give them greater exposure and opportunites to further their craft. Additionally, the National Poetry Slam, which has been held annually at Lit Up, is also a key event that in many ways reflects the continued emphasis on the power of the spoken word. As KidsFest returns to Singapore for its second edition, Gwen Pew sums up the five shows that will be hitting the stage this year. ‘Horrible Histories: Ruthless Romans’ in KidsFest 2013. Photo courtesy of ABA Productions. 10 Dec 2012: Little ones are in for a treat this at KidsFest. Hosted by Hong Kong-based international theatre company ABA Productions, the festival – which takes place in both Singapore and Hong Kong each year – is created specifically for children and their parents to enjoy. All the plays at KidsFest are imported directly from the UK, and they are either still showing at the West End or have been performed there at some point in the past. 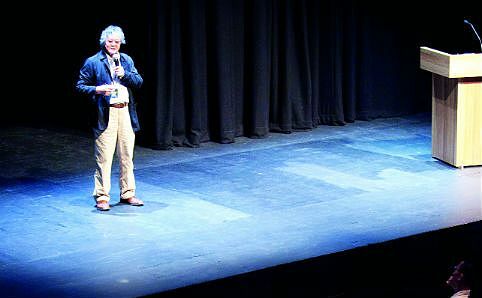 Featuring a mixture of shows – ranging from award-winning productions to smaller, lesser-known shows – KidsFest is aimed at children from the ages of three to about 15, and Gregory hopes that it will encourage the younger generation to improve their English in a fun and engaging way, as well as experience live theatre. Here’s a round down of what’s on offer this year. Based on Julia Donaldson and Axel Scheffler’s eponymous book – which has been hailed by UK newspaper Observer as ‘a modern classic’ – the acclaimed West End production of The Gruffalo has been touring the UK for eight years to date. If you didn’t catch it at the last KidsFest!, here are a few more chances to watch this adaptation of Julia Donaldson and Axel Scheffler’s award-winning story about a mouse who makes up a monster to scare others – and meets it himself! Adapted from the original book and TV series of the same name, which first came out in England back in the 1970s, the character of Mr Benn will traditionally have a different adventure in each book/episode as he dons a different outfit in a magical fancy dress shop, then transforms into that particular character. This stage production, which has only been around for a year and a half, features only two of his adventures – one as a cook and one as a driver – but also includes a medley at the end that follows him to various faraway lands, where he takes on the roles of a knight, a wizard, a spaceman and more. The stories of Mr Benn are about the power of imagination, with the moral being that you can become anything you want to be if you put your mind to it. Ever wondered what would happen if a Viking moves in next door to you, or what the infamous King Henry VIII might have been like in person? This show will answer all the questions you may have had about the long – and sometimes not so glorious – history of Great Britain, condensing the country’s 2000-plus-year history into funny, easily-digestible but still factually accurate chunks. Accompanied by an original score (we’ve heard that there’s a bit with Guy Fawkes, the man behind the infamous Gunpowder Plot in the 1660s, who has a particularly entertaining number), there are also plenty of opportunities for everyone to participate. Don’t worry if that’s not your thing – the producers promised that it won’t involve embarrassing anyone on stage. Get a crash course in Roman history and find out what life was like for people living in the notorious empire in this production, where two actors take on a whole range of characters from Spartacus to Emperors and cover topics as varied as slavery and school life way back when. As it only covers 300 years’ worth of history – compared with the two millennia of Barmy Britain – this production is able to cover more ground and get into the intricate details; your kids will be sure to pick up a whole bunch of nasty facts to show off to their friends afterwards. 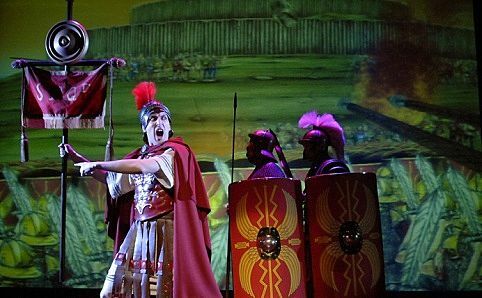 This one’s guaranteed to be a popular draw – in addition to receiving a five-star review from the BBC, Ruthless Romans has also been adapted into a video game – so book early.